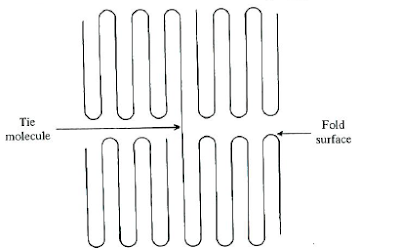 One of the more significant discoveries in polymer science in the 1950's was that semi-crystalline polymers, such as polyethylene, do not crystallize as a fully extended chain ("spaghetti in a box") but rather as folded chains, a highly stylized example of which is illustrated  here on the right. 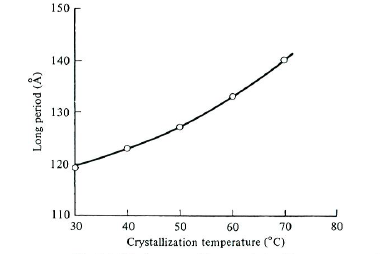 This particular plot was the result of crystallization for solution, but similar results can be found for crystallization from the melt. 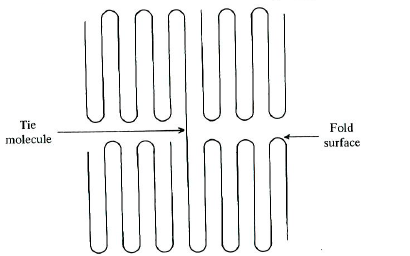 If I did my math correctly , a fold length of 120 nm corresponds to about 83 repeat units of the polyethylene. 83 repeat units is longer, a lot longer than what a new report expects for alkanes. Reading the paper requires a subscription/pay-per-view, but the Computation Organic Chemistry Blog has a nice review of it. In this case, the researchers found that 17 repeat units is the longest alkane that is still expected to be linear. Any longer than that, and the folded configuration is more stable. Now this is not exactly an apple-to-apples comparison. Most obviously, the small-molecule alkane work is not about its crystallization. The research is computational and is supported by gas phase IR data, which means that there are minimal or no interactions with other molecules, only those interactions of the molecule with itself. But still, 18 vs. 83 is a very large difference. Obviously the neighboring segments in the 3-D structure of the crystal supports the longer fold length, regardless of whether the segments are from different molecules or a distant portion of the same molecule. The more serious question that I have is what is the longest alkane that doesn't show chain folding upon crystallization - i.e., how what is the longest alkane that crystallizes as "spaghetti in a box"? Update: A reader has pointed out that that a C-C bond is actually 1.54 Å long, not 1.54 nm long. However, since I misread the fold length off the chart as 120 nm and not 120 Å , 83 C-C bonds was still correctly calculated. A C - C bond is 1.54 nm long. In the trans configuration, the bond is at a 19.5 angle from the backbone, so each bond adds 1.54 nm * cos(19.5o) = 1.45 nm. Then 120 nm / 1.45 nm is about 83 C-C bonds. I think that you have some unit confusion on your bond lengths. A C-C bond is 1.54 angstroms, not nm. You are correct, but my final answer of 83 is still correct, as I misread the fold length as 120 nm, and not 120 Angstroms. "If you are going to make errors when doing math, make two that cancel out." I don't understand the trans factor here. Whereas ethylene is an alkene, isn't polyethylene a saturated alkane? Hence, shouldn't the cos be taken for tetrahedral angles with respect to the backbone? Andy is correct. When I was growing up, everybody in knew spoke of the all-trans configuration, such as these guys.